Dress in layers. Lots and lots of layers. Wear sturdy, water-resistant boots that cover your leg to mid-calf (at least). Unless you are a small child and can be carried around, you will need to deal with this when you encounter it. A minor bit of street slush. Not all taxis or cars pull up flush with the curb. If you’re taking public transit or spend any time at all walking anywhere, you will undoubtedly ruin your expensive fashion boots in a month. Forget Uggs (or Ugg-like footwear) and dressy “riding boots.” Think Bogs, Kamik, or Sorel. Tuck your pants into your boots so they don’t get wet and salt stained. Stand back from the curb when there is a pool of slushy water near it. Passing cars and buses have been known to splash that junk over the lower portions of pedestrians who are standing close to it. In the neighborhoods, beware the sidewalks. 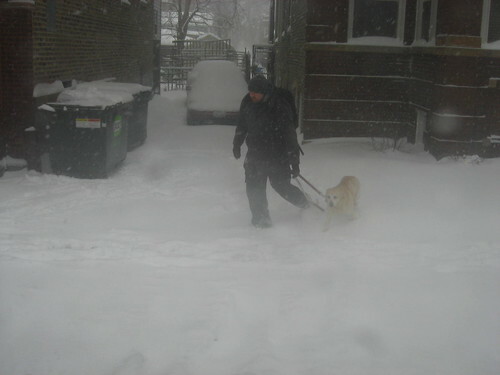 Some property owners are jerks and don’t ever shovel their walks. (Yes, it is the law but there is no enforcement of the fines.) 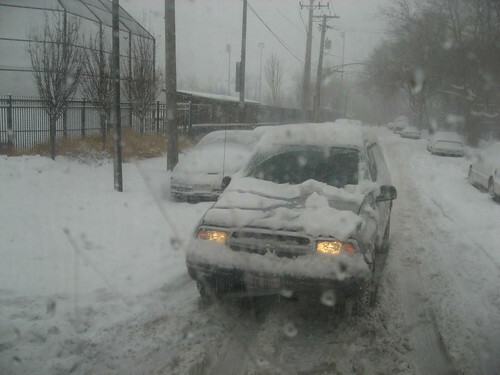 Others are not able to shovel early in the day, so you will likely need to slog through snow on your morning commute. Even attentive shovelers can’t always keep the sidewalk clean enough that it doesn’t have the occasional icy patch. Freshly fallen snow over ice can lead to some really ugly consequences, so learn to shorten your stride and distribute your weight more evenly over each step. In other words, walk like a duck. In the business district, beware the buildings. 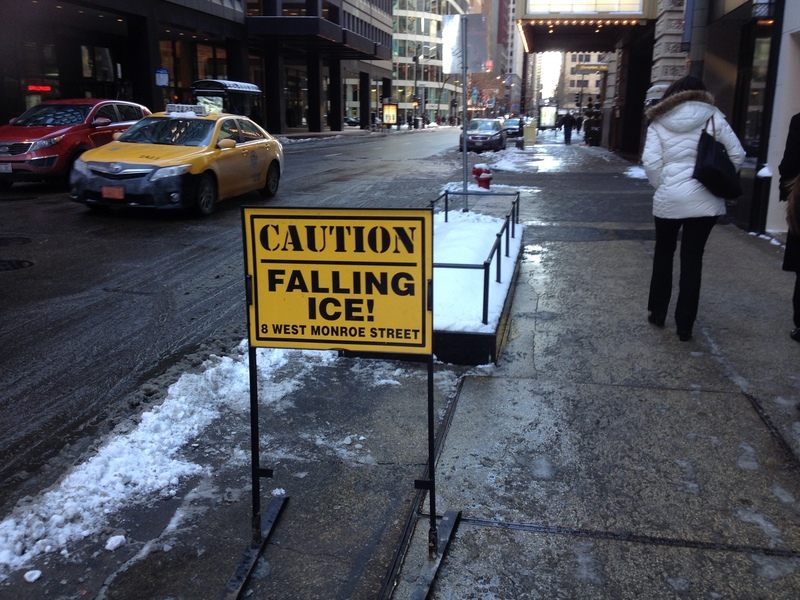 It’s uncommon to get hit with ice falling from the tall buildings, but there have been enough incidents that these signs spring up all over the Loop during winter. Litigation deterrent…er, I mean warning sign. Take enjoyment from simple outdoor activities, like shoveling. Maybe you are a renter or live in a condo so you think you won’t need to clear snow. 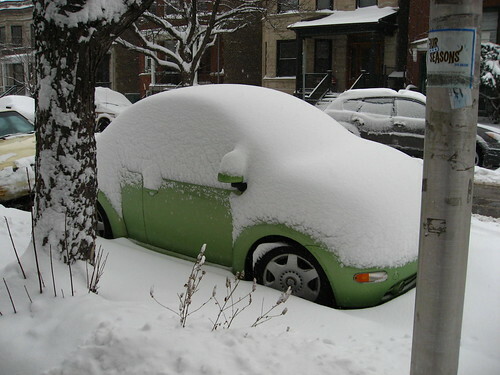 If you own a car, though, you will need to shovel at some point. Maybe you’re even lucky enough to have indoor parking. You can still get stuck driving down a side street before it’s been plowed or getting out of your garage into the alley. (The otherwise excellent street plowing crews deal with side streets last, and don’t do alleys at all. Chicago instead lets the garbage trucks “press” the snow down in the alley as they collect trash, which is the closest they come to plowing them.) Or maybe you’re tired of hearing someone spin their wheels helplessly over and over and over again as you’re trying to concentrate on a book or go to sleep, so you throw on your many layers and water-resistant boots, and go out to help. Either way, you may need some ibuprofen and Icy Hot (and perhaps a slug of whisky) at the end of the day. Learn about “dibs” and be wary of those who tenaciously cling to it. Yeah, it’s not legal but you don’t want to be the victim of retaliation. This could include getting chased by someone wielding a shovel if you so much as touch the stuff marking a dibs spot. More ominous things like a busted windshield have been known to happen. Look for the “silver lining” in the weather. And although it’s not strictly about winter, there are many winter anecdotes on this list. Help! I need a parka! I really, really hate shopping. I don’t enjoy browsing at clothing and shoe stores, so I only go into one when I absolutely must. That means I go in with a mission: buy a pair of black work pants, for example, or get some new gym shoes. This is one reason why I don’t usually visit thrift stores for clothing. It’s possible to find some really great items at thrift stores, but it usually involves lots of browsing through the racks. Same thing for places like Marshall’s, Ross, and TJ Maxx. While I do go into these types of stores for housewares, I rarely need that stuff so visits are few and far between. I pay enough attention to retail to know which stores are likely to carry what I want to wear, so that helps me keep my shopping time down to a minimum. And once I’ve gotten a good feel for a retailer’s clothing line, I will order online as much as possible. 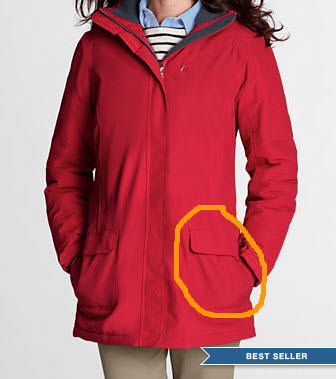 So I really, really hate that my beloved Lands’ End has dramatically changed their classic Squall parka in all the wrong ways. I have a Squall parka that I bought several years ago. It’s awesome. I have a different Lands’ End coat — referred to as a “sleeping bag” by one of my colleagues — for the super cold days, but for most late fall/winter days between 35 and 0 F here in Chicago I can get by with the Squall parka. Last winter, this coat seized up on me, though. The zipper completely jammed and I had to crawl out of my parka after I got home. 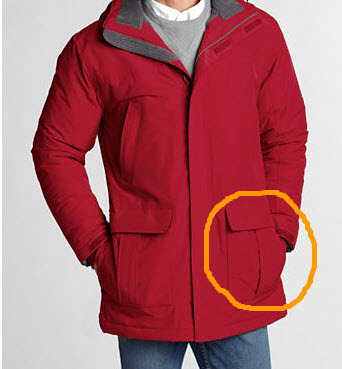 There is no way to fix this zipper jam, although I have thought about replacing the zipper. The chance in finding a tailor who could replace the double zipper with a reasonable match in color is slim, though. I got a good recommendation from someone, but I have my doubts that schlepping this well-worn parka to a tailor nowhere near where I live or work will have the result I want. I’ve already tried on their “updated” Squall parka and find it sadly lacking in some critical features. Such as being just slightly over-sized so I can wear a sweater under it. (Seriously, one should be able to layer up under a parka!) Also, having pockets that allow one to place objects like hats or gloves inside them. The “new” Squall parka has pockets that only accommodate a slender hand. I just don’t understand how a company that is based in Wisconsin could make such changes to their winter wear. But because Lands’ End does guarantee their clothing, I’ve decided to try once more to exchange my broken down Squall for a workable Squall parka. Men’s Squall parka with a better pocket design! At left is the terrible women’s Squall parka, at right is the men’s version. Note the areas circled. How does the men’s version of the coat differ from the women’s version? The pocket has a gusset! With a gusseted pocket, one can slip more than a single slender hand into the pocket. I should be able to stuff my hat and gloves in the pockets like I’ve been doing since I was…well…extremely young. Yeah, the women’s parka is a bit more slim cut than the men’s but that also means I should be able to wear a sweater under the men’s parka, too. Wow. What a concept, eh? These parkas both have interior draw strings at the waist, so I could conceivably adjust the men’s parka to be a bit more fitted, too. So, wish me luck this weekend as I venture to the Lands’ End store and attempt to have them give me a credit or exchange on my old Squall for a nice, new men’s version! When I opened up the coop this morning, all but Speedy came out for their warm mash. Speedy was too pre-occupied with finding a good angle to enter the nest box, which hopefully means I will get at least one egg today. All looked well with no signs of frostbite and they were eating quite greedily. Last night I left the water on a trickle through the faucets of the bathroom upstairs and the kitchen sink. Both have pipes running along or very near the outside walls of the house, so it was a good pre-caution. Both taps were working well this morning, too. My digital thermometer wasn’t even providing a reading this AM, but on the radio they said it was -17F with a -30F to -35F wind chill. Amazing. The snow finally stopped yesterday in the late afternoon. The official tally was 12 inches up here on the north side. All I can say is, it’s a lot. I didn’t spend the day inside like most sensible people, though. Mark was around the house so I took Rachael up on her offer to meet in Andersonville for lunch and then a visit to the Philippino grocery store. I rode the Foster Ave bus to meet her and took my camera with me. I got a few interesting shots along the way. 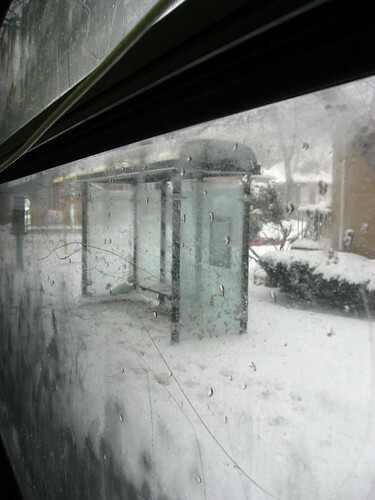 A bus shelter along the route. Getting and off the bus often entailed stepping into more than foot high piles of snow pushed to the side of the road by the snow plows. Dogs still need to be walked on a snow day. Cars have to struggle along unplowed side streets. The plows don’t venture down the side streets until the snow stops and all the major roads are completely cleared. But before you can drive anywhere you have to dig out your car. The situation actually gets worse after the plow goes by since it piles up more snow around it. The Philippino grocery store was delightfully pungent and intriguing. Rachael was able to get the obscure ingredients she needed to make some of the childhood dishes she fondly recalls. And then I had her drop me at the Foster bus stop so I could head home. Although it was Saturday night, I needed a night of real rest and I knew Mark would be gone by the time I got home. The headcold that had bugged me earlier in the week was threatening to return and I needed to replenish the sleep reserves depleted by 2 nights of interrupted sleep. So, I settled down with a hot cup of herbal tea and my knitting for a bit, then indulged in a hot bath. By the time Mark returned to the house, I had already taken a Nyquil caplet and was ready to snuggle into bed for the night. Ah, the simple joys of home. Oh, how I hate that phrase! Lately, the weather reports have included the following: extreme cold, snow, or “wintery mix.” We’re having that last one now, and it is likely the worst. A “wintery mix” means that there will be precipitation of all kinds during a weather event. So far this morning, it’s been freezing rain, sleet, and snow, and it changes back and forth at whim. This makes for treacherous conditions for any pedestrian or car. 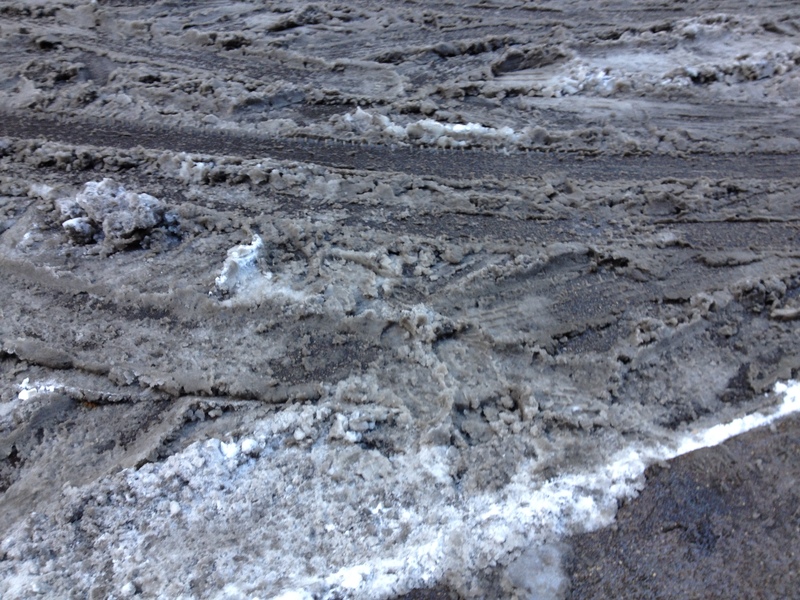 You’re ambling along just fine, and then you hit the results of this wintery mix: slushy, crusty, slippery, icy snow. Likely you will end up on your rear or in the ditch, depending on the way you’ve been moving (in a car or on foot). The other thing making me cranky is that I had to dig out the end of the driveway this morning. Again. It’s incredibly irritating that the plowing service for the condominiums across the alley continues to dump snow at the end of my driveway. If I could catch the guy I’d tell him to stop it, but he seems to come in the dead of night or something. I called the management company to request that they pass on the message, but I don’t have much confidence that the irritated woman who answered my call will do so. She must be upset to be working Christmas Eve. Well, at least I got a good workout of my arms while shoveling. I’m supposed to go to my father’s tonight for Christmas Eve, but I’m thinking that won’t happen now. It’s daunting enough to drive 75 miles one way on my own along various expressways [I’m not sure if the heavily traveled portions or the sparsely traveled portions are the most intimidating]. The current weather situation makes it more complicated. I’d rather not risk black ice on Interstate 80. So, I think it will be another night to enjoy the comforts of home. Last night I made beef stew in the slow cooker and there is plenty left over. I have one DVD from the library left to view, and I fixed the satellite yesterday [it just needed to have some stuff cleaned off around the connections]. I’ve been a good girl and have done an hour of cardio at the gym already today. I even cleaned the chicken coop this morning, so the birds have fresh leaves to snuggle down into tonight. Here’s hoping for a peaceful night. For those of you who celebrate Christmas, have a merry one! …snowing. I think we’ll get the maximum predicated amount of 6 inches before this is over. Yikes! I’m supposed to get to the gym early tomorrow for an hour of cardio, but we’ll see if that can happen. First I’ll have to shovel out the driveway which may be workout enough! Tuesdays aren’t a day I usually work from home, but I did today due to some early morning meetings. I took the rare opportunity to go over to the gym and try out a Vinyasa Flow yoga class there. I’ve been to many different yoga classes over the years and just haven’t found one that I feel comfortable in. I’m not sure about this one either. I found myself stopping the flow and going down to rest in Child Pose a couple times because I just couldn’t hold the pose we were doing. I like to think this was partly due to the fact that I did a major leg workout yesterday and my muscles were sort of shocky. There are parts of me that ache now that didn’t ache earlier today, that’s for sure. The really disturbing thing was the second time I did this and found myself starting to cry. I’ve cried during yoga before, too, but I like to think of that as an exception. I was able to pull myself together and resumed the class, but since then I’ve been feeling sad and wanting to cry off and on. I’m just trying to allow myself space, as I apparently need it. Tonight I was supposed to go to the Windy City Knitting Guild meeting, but decided it wouldn’t be a good idea because of this crazy weather. So instead I will feed myself well, spend a bit of time relaxing, and then…start shoveling. Sigh. We got snow yesterday, and although it isn’t the first time this season the white stuff was flying around, it is the first time it stuck stubbornly in place and stayed there. Today was sunny, but it wasn’t warm enough to melt the stuff either, so we still have snow on the ground. We’ll get more tomorrow, too, if the weather folks are right. So, it’s truly time to hunker down and start piling on the sweaters, wool socks, down comforters and coats, and other winter gear. It seems that this cold and snow has also brought about the final step in integrating my little flock of chickens, too. Last night when I went out to shut up the coops and batten things down for the evening I was shocked to find all 6 chickens inside one Eglu. Yep, that’s right, they were all snuggled in together and seemed quite content with the arrangement. Not only that, but the hens laid their eggs today in the nestbox of the new Eglu, the one in which they piled together last night. Tonight the trend didn’t continue and the hens were back in their “old” Eglu coop by themselves. Maybe they found it a bit too tight inside after all. Note that I only said I have 6 chickens at this time. Anyone not following closely may be excused for not remembering that I had 3 hens up until this summer when I added 4 chicks. 4+3=7, right? Well, 2 of those 4 new chicks turned out to be cockerals (immature roosters). Keeping 2 roosters when I don’t even need one seemed a bit foolhardy, so I re-homed one of them. He also happened to be the loudest, yet most beautiful one, too. So, he is happily taking care of a small flock of Easter Egger ladies, and I have a lone rooster that I’m allowing to hang around for now. If he gets to be a problem in any way, though, he will have to go. All of the chickens were quite put off by the snow yesterday. For the newest ones, this was their first real snowfall. For the older hens, this was their second winter, but they seemed reluctant to acknowledge this strange cold substance again. I had to give them all some treats to get them out into the larger run. The hens are molting and their egg production has dropped. There are days when I only get one egg now, but I’m not complaining. The poor things look a mess. Maisy is nearly naked on her underside, and all of them just look generally raggedy. I’m giving them extra protein in the form of more meat scraps, some cat food, and a higher protein feed. They like a warm mash in the mornings made with the higher protein crumbles and some cat food. If I truly was apt to spoil my birds, I’d give them warm mash in the morning and then a bit of cracked corn in the late afternoon before they head in to roost. Just because I did that today doesn’t mean I’ll make it a habit. Right? Right….